HEAD CHEF PROFILE – WHO IS SHANI KLEYNHANS? 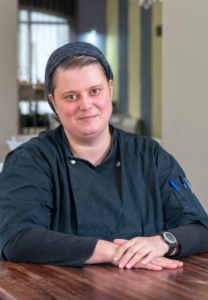 When we think of a woman that we admire at Nitida, we think of our Head Chef at Tables at Nitida, Shani Kleynhans. Born and raised in Hankey, Eastern Cape Shani brings with her down-to-earth determination and commitment. Shani is hands down one of the most endearing chef’s you’ll ever meet. Although our diners don’t know this, she is tough, but all gooey on the inside. Meet our mother hen, Shani! You need to have a passion, natural feeling and understanding for what you do. Without that you cannot do anything. I did in-house training and studies at a restaurant in Jeffreys Bay in 2010 – was then called 3 Fat Fish. before relocating to Cape Town where I found my new home, Tables at Nitida. I always had an interest and passion for cooking, but never in my wildest dreams did I think I would become a head chef! I guess it happened because of hard work and grace. Do whatever you do with passion and excellence. Whether someone is watching you or not, always be accountable in all that you do. Let your “yes” be your yes and your “no” be your no. Yes, a bit dry and on the lame side. Ma, Mama Shani …haha guess I have the same motivation and negotiation skills of a mother, and “no” is not the answer I am looking for. The meaning of life is to each their own. My reality is not someone else’s reality. What is your favourite meal to cook at Tables at Nitida? No particular favourites, love everything we make, otherwise we would not serve it. I love the Nitida Sauvignon Blanc, The Tinkery, Golden Orb and The Dracks MCC. Wonderful to pair with meat and cheese platters in the Summer months. Whatever way people wish to remember me. It’s not up to me to impress people or not, I am who I am, you like me or you don’t. No two people are the same and that’s the way I like it. each day for the rest of your life and why? I must say good quality cheeses, cold cured meats and fresh breads is something I’ll never get tired of. Which dish on the menu would you say is your signature dish? Everything on the menu has my signature on it.